THINK: THE FIVE-AND-DIME VERSUS THE MEGALOMART. Your hometown’s Fourth of July parade or New Year’s Eve at Times Square. The old downtown movie palace or the 14-screen Multiplex. Think: the Lesser Airshow versus the Greater. 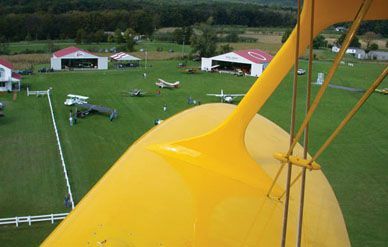 Part nostalgia-fest, part county fair, the Lesser Airshows move at a more leisurely pace, offer a variety of fun distractions, and sometimes provide wonderful food from local cooks. And let’s face it, the shorter the line ahead of you at the Porta-John, the better. “Lesser” is a relative term here. Brian Ranch Airport in Llano, California, hosts what it bills as The World’s Smallest Air Show (this year, May 29 and 30), which brings in about 1,000 people. Others average 5,000, while some may get up to 70,000. Even then, these shows offer audiences much more breathing room than you’ll find at blowouts like Oceana, Virginia’s Neptune Festival (300,000), California’s Marine Corps Air Station Miramar Airshow (500,000), and Oshkosh, Wisconsin’s week-long AirVenture (750,000). A small show doesn’t necessarily mean only small airplanes. California’s Watsonville Fly-In and Airshow (May 28 to 30), known primarily for a world-class exhibit of antique aircraft, recently hosted a half-dozen Marine Corps AV-8B Harrier vertical-takeoff jets, perhaps the world’s loudest aircraft. The Tucumcari, New Mexico Rotary Club Airshow (September 29) regularly hosts the Canadian Royal Air Force’s Snowbirds, who fly CT-114 Tutor jet trainers. “Years ago the Snowbirds talked us into having our airshow on Wednesday, and we have never looked back,” says organizer Bob McClelland. “We can get all the big names because we are the only airshow in the nation on that day.” Nearby schools and many businesses close up, and the whole town turns out for the show. Flexibility can give smaller shows a quirky charm. Many, for instance, don’t hew to a strict all-aviation program. At Georgia’s Vidalia Onion Festival Airshow (May 8 and 9), you can jog in the Onion Run, watch the Budweiser Clydesdales, or take in a rodeo. For the kids, there’s a carnival. The children who attend Llano’s World’s Smallest show can enter an art contest, drawing an airplane or anything else at the airport. The Blue Ash Airport Days in Cincinnati (June 12 and 13) offers attendees the chance to enter a 5K race, which is launched by a flyover by one of the show’s performers. “We give an airplane ride for the first-place prize,” says organizer Cheryl Popp. Audience members can also buy rides: There’s a Stearman, a B-25, and, for the less adventurous, a Cessna 172. The show has a classic and antique car show, an oldies concert by a local band, and that well-loved aviation tradition, the pancake breakfast. The homey food at small airshows can be as big a draw as the aircraft. “We have a barbecue cabin with smoked pulled-pork sandwiches, and the Black Forest Restaurant serves German sausage, sauerkraut balls, and cabbage balls,” Popp says. “Sounds awful—and I’m German!—but they always sell out.” At the World’s Smallest Airshow, organizer Felice Apodaca notes that a fair number of people show up just for the community association’s bake sale.